Taichung, released by TAITRA on November 7th— The 2013 Taipei International Sporting Goods Show (TaiSPO) will take place concurrently with the 26th TAIPEI CYCLE in celebration of its 40th anniversary, TAITRA, the show’s organizer, said. A 5-day extravaganza will begin as the 40th TaiSPO opens on next March 19th, one day earlier than 2013 TAIPEI CYCLE, and will be held in conjunction with Taiwan Int’l Diving & Water Sports Show (DiWaS) and Taipei Int’l Sports Textile & Accessory Expo. The scale is estimated to feature a record-breaking 5,000 booths, attracting more than 8,000 domestic and international buyers. TaiSPO represents a consistent effort to turn Taiwan into Asia’s hub for sporting goods industry. While the competition of sporting goods industry is getting intense, Peter Lo, chairman of Johnson Health Tech Co. and convener of the Division of Fitness Equipment and Accessories under the Taiwan Sporting Goods Manufacturers Association (TSMA), founded the S-Team. Offering joint consultancy by TSMA, the Footwear & Recreation Technology Research Institute and the Corporate Synergy Development Center, the S-Team will hopefully establish a cooperative network made up of central, satellite and supporting factories, so Taiwanese fitness equipment makers can adopt a business model that is based on brand-specific sales channels in addition to research, development, and innovation (RDI) programs. The S-Team, founded in May 2011, has successfully introduced a national standard of fitness equipment this October and plans to set up a dedicated pavilion at TaiSPO 2013, as it did this year. It will showcase exciting results of a year’s efforts, as well as refreshing contributions to the industry. While TaiSPO is an indicator of trends in the sporting goods industry, the TaiSPO Awards of Excellence gives a sneak peek at the latest and most innovative products in the sporting goods industry. According to the list of preliminary winners published online, 14 products are nominated in the TaiSPO Awards of Excellence 2013. After 40 years of progress, TaiSPO stands as the second largest sporting goods show in Asia, a world-class trade event which has been also in good connection with the WFSGI to hold Manufactures Forum for consecutive 4 years. In appreciation of the support over the years, Taitra, the TaiSPO organizer, launches a special event, called “TaiSPO 40th Anniversary Lucky Draw”. Buyers, who have completed online pre-registration at http://www.taispo.com.tw by March 1st, 2013, will be auto-entered in the Lucky Draw. The TaiSPO 2013 will run from March 19th-22nd at Taipei World Trade Center (TWTC) Exhibition Halls 1 and 3,Taipei, Taiwan, including fitness equipment, sportswear and accessories, outdoor sporting goods, sports balls, protective gear, massage equipment, and more. 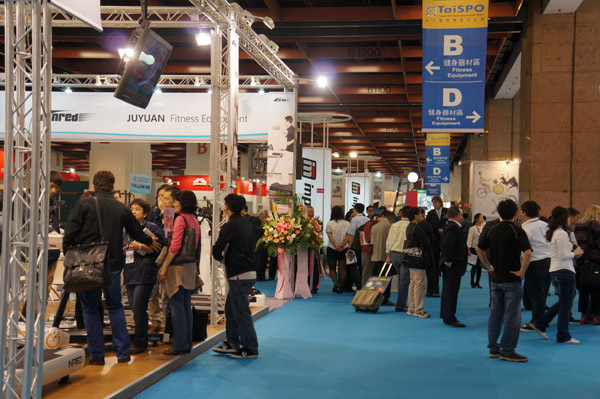 In 2013, the Taiwan International Diving and Water Sports Show (DiWaS) will also offer an integrated display of swimming, diving, and water sports supplies as a part of TaiSPO for the second consecutive year. The 5-day celebration is definitely a must-see as it includes the TAIPEI CYCLE and SpoMODE, scheduled for March 20th-23rd, 2013, at TWTC Exhibition Hall 1and the Nangang Exhibition Hall.